Pet Shop Boys will release their new single "Thursday", which features the UK rapper Example, on November 4th. The music video was shot over in Shanghai and premiered today on VEVO. The video can be watched from the link below this article. "Thursday" will be released on CD and digital bundle with a 12” to follow. 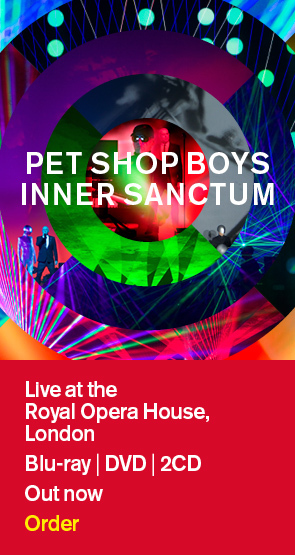 These releases will feature remixes by Tensnake and Eddie Amador, and two brand new Pet Shop Boys songs. The format information is as follows: CD / Digital bundle 1. Thursday (radio edit) 2. No more ballads 3. Odd man out 4. Thursday (Tensnake remix) 12" Vinyl Side A 1. Thursday (album mix) 2. Thursday (Eddie Amador main remix) Side B Thursday (Tensnake remix) The CD and digital single formats are now available to be pre-ordered. Meanwhile, the 9-track "Love is a bourgeois construct" CD has gone on sale today.